This is a recipe I haven’t prepared for over 10 years. I came across this long lost recipe tucked away inside a cookbook I have not lifted off the shelf for ages. Right away I added the ingredients to my next shopping list. I can not even remember where the recipe came from, but, it is hand written by me in a very short, almost undecipherable manner. I set out to make sense out of it and it all started coming back to me as I was cooking and it took me back 10 or 12 years. The smell, the taste, the preparation all represents a time when my son was a toddler and life seemed so simple. I revisited this soup over and over back then, and I can not imagine how I lost track of it for all these years. I used a very spicy sausage this time and it was delicious. You may tone it down a bit if your palate doesn’t handle spicy too well. I couldn’t remember if I made it with sweet potatoes or yams, so I chose the latter, however, I think sweet potatoes would be a nice offset to the spicy sausage. Knowing a roux is always made with butter, I decided to try to achieve the same results using olive oil, and it worked! If you would like to use butter instead of olive oil, omit the olive oil and use a 1/2 cup (full stick) of butter. Final note, the recipe calls for cream and I substituted whole milk and it was perfect. This is a one pot dinner. Heat olive oil over medium high heat and add sausage, onions, celery and garlic. Sauté for 5 minutes until well combined. Sprinkle in the flour, a little at a time stirring constantly until a blonde roux forms. Add stock one large ladle at a time while stirring until soup consistency is achieved. Add sweet potatoes or yams. Bring to a rolling boil, reduce heat and simmer for 30 minutes. Additional stock may be added to retain proper consistency. Add milk, chives and parsley. Season to taste using salt and pepper. Once potatoes are tender, serve in individual bowls. Put a handful of spinach in the bowl, then ladle the soup on top, garnish with additional chives and parsley. Sounds like a great fall soup! I thought the same thing… a great fall soup. I would have to use turkey sausage being that I don’t eat pork- just a health choice. I will have to try this recipe- with some cornbread- sometime this fall. This sounds so comforting and flavorful. I have no idea what yams are! We don’t have them in France!!! They look similar to sweet potatoes on your picture, could I use that instead if I wanted to make this soup? Yummy soup. I am so excited for cooler weather I love soup. This is wonderful! Mine too, I love wearing a sweater or light jacket, I love the deeper colors. I love not having to use my AC in the house and have my windows open letting the crisp fresh air in, Oh I totally agree, Fall is my favorite season. Oh and I LOVE apples and pears. Funny thing is…I did have the leftovers for breakfast the next day and it was wonderful! So you wouldn’t give Katzen’s Borscht two thumbs up? I haven’t tried it, but I know how it is when you make something and it isn’t impressive as you remembered. I remember loving it when I made it years ago so perhaps my expectations were too high. But I enjoyed the spicy apple raisin coleslaw that I made with the other half of the cabbage so much more! And there are so many wonderful things to do with beets – a friend made a roasted beet dish with pecans and feta that was out of this world. I must try doing that. So although I love Mollie Katzen’s books – I probably would not make the borscht again in a hurry. 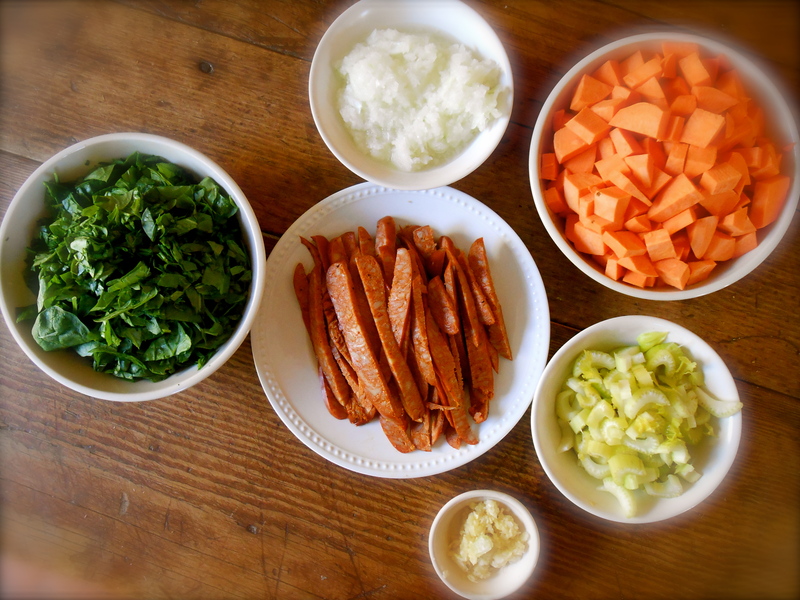 Also – took an hour just to get all the vegetables prepared BEFORE cooking! Phew. Exhausting! I must have been so much more ambitious way back then…. Hmmm. I will look into that, thank you for the information! And how did I not know you are in Belguim? I first read “yam” as “yarn”! ha! you know what’s on my mind. This sounds delicious especially in this new fall weather. If you make it, will simpler times come? I can see why you thought it said “yarn”! Well, I made this soup the other day and life has not been simplified AT ALL! :) How do you keep up with two boys? I have some more “stories” for you so we’d better get out together soon! I don’t, & we’re going under a bit this week! But I am baking Apples for Jam’s banana bread right now! & Yes, let’s get together very soon! Let me know when you’re free. I loved the way you introduced this recipe Seana… how it brought u back 10 years ago to when life was much simpler and your son was still so young. Sounds like a wonderful way to usher in the colder days, and spicy sausage definitely sounds like a wonderful kick! Thank you Felicia! :) I am such a soup person! And to have a little spiciness in it is all the better…especially in cool weather. Let’s see …. you must be warming up a bit? Nice to hear from you. this is why I love hand-written recipes…you’re never going to re-discover an old favorite with so many tactile memories online. (though you passing this soup recipe onto me via the internet is perfectly ok :-D ) Thanks for sharing. Feeling very fall-ish right now. Never thought of it that way before and it is so true. Certainly enjoy getting recipes from blogs and online sites, however, nothing like an old tattered and torn recipe from the past. This soup is simply irresistible! Love the fall weather! I remember one-pot meals like this being perfect when I had toddlers underfoot. I love rediscovering old recipes too. Some recipes became immediate favourites, we overdosed on them, and they were folded up and tucked into the back of the recipe file! I’ve had a few over the years too – must revisit my old recipe folder. This soup looks fab, with 2 of my favourite ingredients, namely sausage and sweet potato. Love the liberal scattering of parsley on top. Yum. I see that you too have reached soup season – chilly mornings, frosted grass! This recipe looks lovely, I imagine that without sausage but with a spicy chili added and some smoked hickory salt you would have a great vegetarian alternative. Yams, yum! Yes! Certainly could just omit the sausage! I love your idea about the smoked hickory salt. Sounds delicious. Having spent winter in the tropics I’ve skipped the soup season, sadly, though as we head south I feel as winter may not be over just yet. I’m going home to try this, your soup sounds delicious! Heading home? Sounds like you have a fantastic time on the road. Maybe you’ll have a little short time to get in a few colder weather dishes before it turns hot. 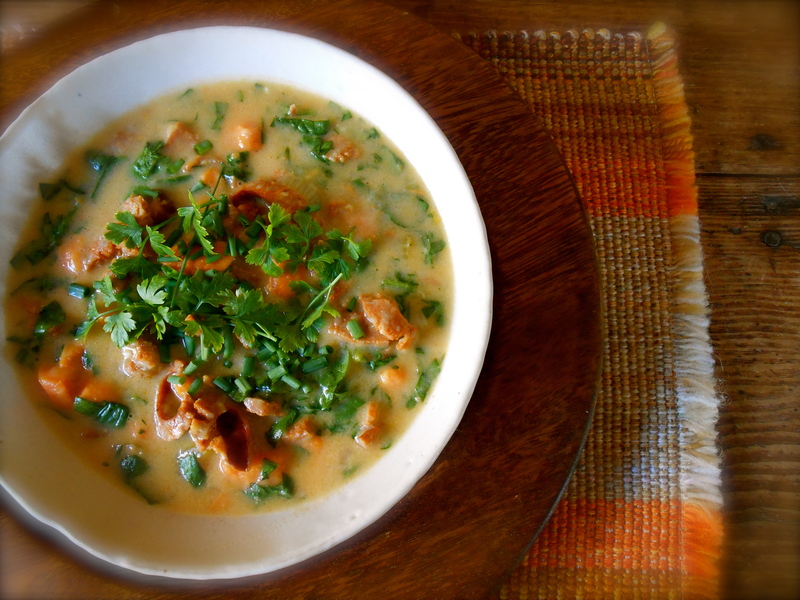 Hope you get a chance to try this soup…it’s lovely. i think i’m loving it even more with tons of crispy bacon…..
that jullienned smoke sausage is kinda smacking delicious…. Sure…crispy bacon…why not? Sounds like a great alternative. Sounds great. Especially for these damp, cool evenings we’re having. Always surprises me that there must be a very wide selection of differing sausages in the States. Here, I’ve never seen chicken sausages. Never mind spicy ones! Although Cumberland (spicy with pork and black pepper) would be a nice sub. Damp and cool here too. We had major electrical storms yesterday, a bit of a rarity in these parts. You wouldn’t believe the assortment of chicken sausages available here. Sun dried tomato/basil, spinach/feta, mushroom/olive…to name a few. I do like to stick to the basic spicy ones myself. And yes! Spicy pork and black pepper sound lovely. This is making me hungry! It’s approaching dinner time and here I sit without a plan. CGH! This looks absolutely fantastic. Perfect for the cool weather coming down the pike. Thank you! Hearty with bursts of different textures and flavors is my kind of soup. The spicy sausage sure adds a perk to it! Really is a wonderful soup and the spicy sausage was the star of the bowl. Thank you Fae, nice of you to stop by! Yum! looks delicious and comforting. Don’t you just love comforting food! Although the sausage really gave this one a kick! it was still very comforting. I am so ready for soup again!! We need a little bit more cold weather down here. This looks super– I’m saving the recipe. Love that it is an old recipe you stumbled on. Sometimes they’re the best. Me too! Although with my love of soup it could be 90°F outside and you will may still find soup on my stove. :) The cold weather is on it’s way and I couldn’t be more pleased about it. Can’t wait for soup weather! This looks lovely! Soup weather is just about here and this sounds perfect for the cooler weather. I’m not accustomed to sausage in soup nor yams. For the surprise value alone, this would be worth making. I’ve pinned it for future reference. This one will come in handy. This looks delicious. I love that you use yams and not potatoes. I will definitely be making this as fall marches closer. Isn’t it amazing how smells and tastes can send you back in time. It’s cool to come back to recipes when you’re now in such a different place. Thanks for the lovely post. Thank you Amanda. It’s always a pleasure to hear from you with your thoughtful comments. Oh yams are the BEST! And adding spicy sausage? This sounds perfect for the upcoming winter—NYC just got hit with a sudden cold spell and none of us were ready for it. It’ll be good to have this recipe in the arsenal ;) So looking forward to soup weather. You are so creative to make a roux with olive oil! I love the way the light hits the bowl of soup in the first photo. Makes it look extra “yummy”! Thank you…making the roux out of olive oil was a bit out of necessity…I was out of butter and too lazy to run to the market! Ha! :) We are running out of daylight here and it is becoming difficult to snap photos of dinner! The natural light is so nice… but your photos will still look great! As for the butter, I always keep a bit in the freezer. God forbid we run out of butter – my children would not know what to put on their bread! You are currently reading spicy sausage, yam and spinach soup at COTTAGE GROVE HOUSE.